2016 was an AMAZING convention year. We met some many awesome actors. At the beginning of the year, I had no clue of how great it was going to be! We started with Walker Stalker Con London in February. And that was an unbelievable start. It was amazing to meet Melissa McBride, Chandler Riggs, Sarah Wayne Callies and Josh McDermitt. And we saw Norman Reedus, Andrew Lincoln and much more actors from the Walking Dead. Today we're looking back on the actors we've met during 2016. 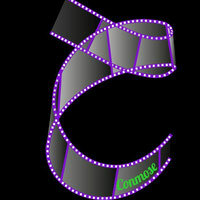 We'll share our top memories with you and we will also show you which articles about meeting a specific actor or actress were the most popular on Conmose. Next year we will meet many many more actors. And we are already looking forward to it. We are so excited. 2016 is a beautiful year to look back to. And we're excited to think about the opportunities 2017 will have for us! That's just so true, I for one have met some of my childhood heroes this year. But other than that we met some amazing people this year and with the growing amount of conventions, 2017 will surely have a lot more in store for us. It won't be easy for me, to make a personal top 3 for you. 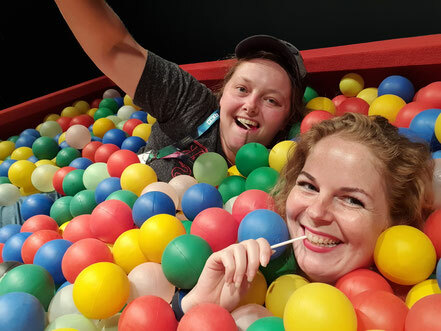 There are just so many great memories to choose from! 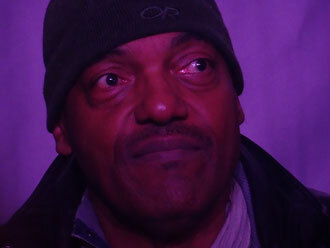 On the fifth place, this year is Ken Foree! We actually didn't meet him this year, but we only started Conmose this year. And we are looking at how often articles are read during 2016! He's known for Dawn of the Dead, Water for Elephants and the Devil's Rejects. I just have to say: I totally loved meeting him. He was very spontaneous and interacting with his fans all the time. So true, what a great guy he was! At one point he even asked for my camera, so he could take a picture of Carola and me. Want to read our article? Check it out! The fourth place is for Violett Beane! We met her at Arccon, organized by KLZ Events. Have you already read our interview with KLZ Events? 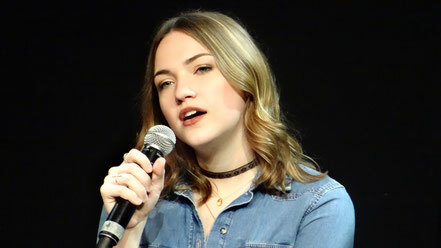 Violett is known for playing Jesse in The Flash. Jesse is the daughter of Harrison Wells from Earth 2. She's been on Earth 1 as well: She was taken to Earth 1 by Barry along with her father, but she didn't want to leave the life she had on Earth 2 behind her. 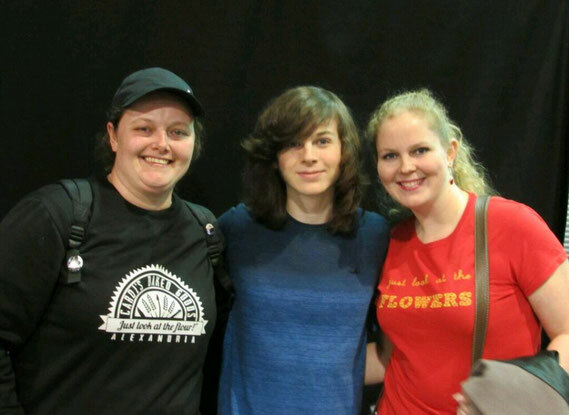 We loved meeting her at Arccon (Did you read our article about meeting her?). It was the first time for her to attend a convention. And it was awesome. She danced with the audience and answered all the questions. I even talked to her a bit when I went to get an autograph! It was great to see how excited and astonished she was that people actually wanted to meet her. Meeting Lew Temple was just amazing. Our article about it got a lot of views! And it's even an article that's quite recent. We met him in November 2016! Maybe it's because he's such a great guy. Very grateful to all of his fans. Or maybe it's because he thanked us for the present we brought him on twitter. Maybe because he's just an amazing actor. So many reasons. Well, we do love looking back on this! We sure do! I will never forget the moment I saw his tweet about the present we gave him. 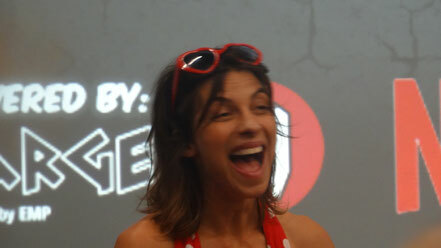 Who doesn't love the spontaneous and happy Natalia Tena? Wow, she really amazed me at Amsterdam Comic Con. And you guys loved to our article about it. I do have pictures of Natalia of better quality. But I just believe this picture says it all! She was like this all day. Natalia Tena is best known for her roles in the "Harry Potter" movies (Nymphadora Tonks) and for "Game of Thrones" (Osha). It was so great to meet her. As a huge "Harry Potter" fan, it was so great to meet Natalia (and Devon Murray) at Comic Con Amsterdam. 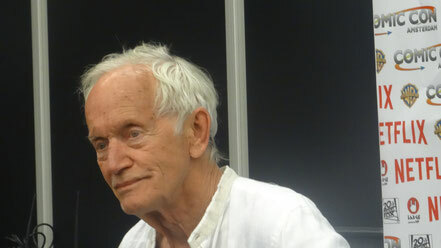 Our article about meeting Lance Henriksen was the most popular. I was quite surprised. I didn't know he had so many fans! Lance is an American actor. He mainly plays in science fiction, action and horror movies. He's known for the Alien movies, the Terminator, House 3, Mansion of the Doomed and so much more! This was a magical moment. I loved meeting this legendary actor. He played some great roles and he told some great stories, during his Q&A. Besides that, he was so incredibly nice! He took his time to talk to us and when we asked him if we could take a picture, he instantly agreed and came from behind his table to pose with us. I have so many good memories of the actors we've met in 2016. I liked it a lot to meet so many actors and actresses. But of course, there are some memories that really stand out for me! I will share the best ones with you. I have to mention meeting Ian Beattie! In Game of Thrones Ian plays the role of Ser Meryn Trant (5 seasons). Ser Meryn Trant is a member of the king's guard and he is a bad, bad guy. 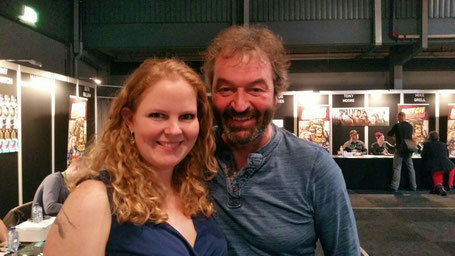 I'm always thrilled to meet someone of the Game of Thrones cast, so, of course, I was happy to see Dutch Comic Con announce Ian Beattie. He immediately stood out: He was so energetic! It was amazing. And very, very chatty. I loved to see his Q&A. It was truly fun to watch. We went to get an autograph and immediately Ian started talked. No time for worries or being nervous: He just started to talk and ask questions. That was really great! I asked for a selfie and that was no problem at all. he was happy to do so. It was great meeting him and I will always remember it! I met Shantel VanSanten at Arccon. (Organised by KLZ Events). You can always check out the full article about her. I know Shantel for playing the role of Patty Spivot in the Flash! Why is Shantel in my top 3? She's an amazing person! Thanks to the way Arccon was set up, we got to see a lot of Q&A's from the actors. So we managed to see a lot of sides of Shantel in a short time. I loved the chemistry between her and Rick Cosnett, even though they didn't play in the Flash at the same time. But she also opened up and talked about life. It was just amazing to hear her stories. Besides that, she was awesome during the photo op and the signing. When I got the autograph we talked a bit: I told her that I loved Patty Spivot in the Flash: Where I thought it was kind of hard to see Eddie tear Iris and Barry apart I didn't have any trouble with Patty. I would have loved to see Patty and Barry spend more time together. I thought they would be a great couple and I would love to have seen her on the show for a much longer period! I was happy to be a bit more prepared, because when I went to get a photo op I wasn't haha. I told her I loved her dress and I was glad to see her at the convention. And she started talking back. Somehow that really took me by surprise and I didn't know what to say anymore. Haha but it all went better when I went to get an autograph. She's a great person and she was awesome in the Q&A. Some great memories to look back on! Meeting Seth Gilliam is definitely on number 1! I was so, so excited when he was announced for Dutch Comic Con. I know Seth Gilliam for his roles in the Wire, the Walking Dead and Oz. And meeting him was everything I hoped for. 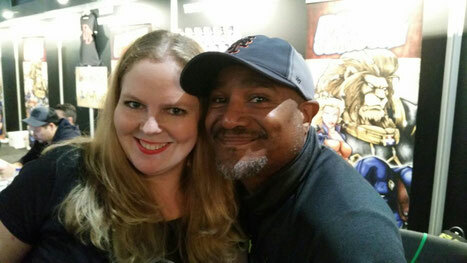 I already wrote about in our article about meeting Seth Gilliam and we also vlogged about it. We were at Dutch Comic Con the whole weekend. I went to see his Q&A twice! And even asked a question (See the video below). I also went to get an autograph and took a selfie with him. We even talked a bit (I asked him something about Oz) and he was very kind and took his time to talk. I was the happiest as I can be. I just couldn't believe how great was and that I actually had a talk (Usually I just freeze and can't say anything). I'm super thrilled that he's attending Weekend of Hell in April 2017. So I get to see him again!! How cool is that? A chance to relive my best actor moment of 2016! I'm not very good in making "Best of.." lists. So I will share some of my best memories with you but they are in random order. I also want to say that I really loved meeting each and every one of the actors we met. So let's highlight some of my best memories..
As a kid I always used to watch "MacGyver", I just loved that show. In the world of Angus MacGyver, anything was possible. I was so excited when Richard Dean Anderson, who plays MacGyver, was announced for F.A.C.T.S. this year. And I must say it was so great to meet him! He was just so very kind and appreciative towards his fans. I was wearing my MacGyver sweater and he instantly noticed it and started talking about it. 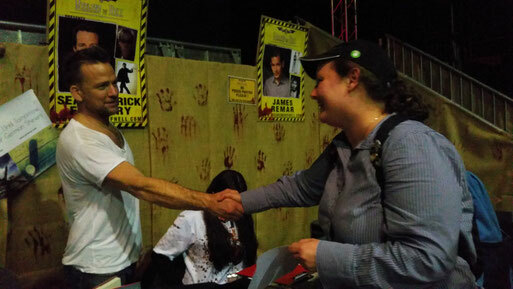 There was a huge queue at his table throughout the day and usually all the actors leave at a certain time, but Richard stayed and kept signing until everyone who wanted an autograph had one. I also got an autograph and it was great to have a little time with my childhood hero! Want to read all about it, check out the article I wrote about this magical moment! 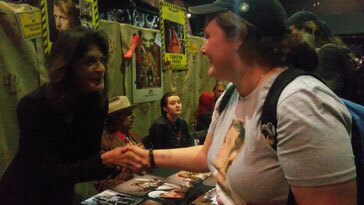 Meg Foster was a guest at Weekend of Hell last November. She played in a lot of movies and series. I recently saw her in "Pretty Little Liars" and "31" and for some reason I had the feeling I just had to meet her. I had some candy for her and I just wanted to give it to her and have a little talk with her. Well a little talk became a big talk and one of the highlights of my year. I haven't had the time to write about this meeting yet, but I will for sure. So keep checking our website for that one! Another great moment at Weekend of Hell 2016. "The Boondock Saints" is one of my all time favorite movies and one of the stars of this movie is Sean Patrick Flanery, so I was very excited to have a chance to meet him. And it was so great! He really seems to love meeting his fans and his fans love meeting him! He is really energetic and constantly interacted with everyone walking past his table. We gave him some "stroopwafels" and told him about our website and he seemed really interested in what we had to say. He took his time to talk and he was so very kind. Other than being a great actor, Sean also wrote a book ("Jane Two"), which I am reading at the moment. Check out our article about meeting this incredibly talented guy. Of Course there were a lot of other great moments, like meeting Sean Astin (two times), James Marsters, David Hasselhoff and Robert Englund. And I am pretty sure more will follow in 2017! Wow you have had a amazing year meeting so many wonderful actors, I can't imagine the excitement! I'd love to meet Lance Henriksen, have seen him in quite a few movies will have to go back and read your post about him. What a fantastic year you have, you met so many awesome actors! Love the actors from the Walking Dead, especially Sarah Wayne Callies as she is one of my favorite actress! Can’t wait to see her in the next season of "Prison Break” and Colony :-) May every day of the new year glow with good cheer & happiness! Omg you are very very lucky! I do not know all of them but I saw some actors that I would love to meet one day! Like Richard Dean Anderson...I think every body was watching McGyver back then! Aww, I'm glad that 2016's been super nice for you. You must have been thrilled to meet all of them. You're one lucky gal - not everyone gets to have the opportunity that you did. I know 2016's been awesome and I wish you an even greater year of opportunities in 2017. Happy New Year, Carola. Wow, you've got a lucky year for seeing and meeting a lot of actors. You might be really elated to finally meet some of your favorite actors. I think I would be really happy as well if given a chance to meet some of them. Your 2017 would be an amazing year as well. Kinda excited for the numbers of your collected actors for this year. 2016 has been great for you! Nice for you to have met these actors. Happy New Year! More wonderful moments this 2017! Wonderfuk actors you have met! Did you ask for tips from them? It was indeed a lucky year for you. Congratulations. I find your blog amazing too. Will go back and read some more! It has been a great year. By the way, I like how Violet has more exposure on the Flash and Shantel is also on the Shooter, but not so much though. Anyway, it's a new year, and more to come for you. Wishing you all the best and feature more of my faves too! This is awesome. I'm glad you met so many of them. Other people could only hope and dream of these chances. What an amazing year you've had meeting so many legends! 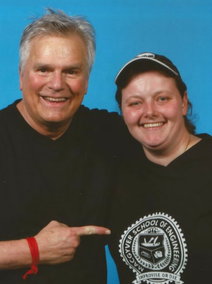 Most of these on your list are quite new to me, and as I was reading I was hoping to come across someone familiar, and there was Richard Dean Anderson, haha! I was addicted to Macgyver as a kid, so seeing him here gives me such flashbacks to the 80's, LOl. I hope you meet even more celebrities this 2017! Wow, you have met quite a lot! That must be so cool! I am so jealous that you met The Walking Dead cast! wow your collection of actors you've met is quite impressive! This whole convention thing is pretty awesome. You go to so many! they must be really fun and exciting. The walking dead convention must have been really cool specially. Most of these on your list are quite new to me. I am so jealous that you met The Walking Dead cast. I'm a fan!! I hope you meet even more celebrities this year! Good luck!